Looking at this another way, the CBPP also finds that middle class households are 60 percent of the US population, and they receive 58 percent of the benefits from entitlement programs. 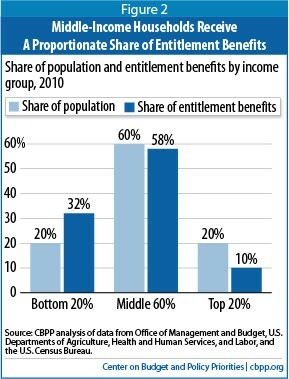 There is some redistribution, but it is from the top 20 percent of households to the bottom 20 percent. Too many people have been misled into believing that their problems are the result of a non-existent “moocher class.” Those at the top, those who have benefitted the most from our economic system, have pushed this myth in a successful attempt to reduce their tax burden. They are the job creators they tell us, and cutting their taxes instead of using the revenue to fund “abused” social insurance programs will somehow cause income to trickle down and help the working class. We tried that, and it didn’t work – a new approach is needed. The working class is not asking for income to trickle down to them, and they have been misled about the amount that trickles away from them. All they want is a fair share of what they’ve earned and the opportunity to improve their lives if they work hard and play by the rules. They want the security of knowing they aren’t a pink slip away from living on the streets, that they can find another job easily if they are laid off and, if not, help will be there for them. Working class households want to know that their kids can go to a decent college without being saddled with burdensome debt and that quality affordable health care is available if they need it. They want to look forward to a better economic future instead of the same struggles they’ve had for years and years, and they want to have confidence that their children will do better than they did. They don’t feel like they are getting any of this. Instead, the very rich have gotten richer and the political system has become even more unresponsive to their needs. One way to judge the health of an economy is in its generosity toward the less fortunate within its borders and around the world. When jobs are easy to find and incomes are rising, people are willing to share. They are more open to social insurance programs that redistribute income to the less fortunate, they are more willing to accept immigrants, and they are less fearful that trade agreements will cost them their jobs. They are more tolerant of a political system heavily influenced by wealth. But when the economy is not as good, when incomes are stagnant, jobs are anything but plentiful and people are struggling to make ends meet – when they see a political system that works against rather than for their interests – generosity toward others is understandably more difficult. They have their own problems to take care of and their own worries about the future, and those closest people to them have to come first. The health of an economy is not fully reflected in the unemployment rate, the inflation rate, or even GDP per capita. It also depends upon the economic security people feel and the perception that the economic and political systems treat them fairly. The rise of Bernie Sanders and Donald Trump is a clear sign that people are frustrated with the opportunities and rewards this economy offers them, and they are tired of a political system captured by wealthy special interests. The two sets of voters – those for Sanders and those for Trump – see different causes and different solutions to the struggles they face, but the goal in both cases is the same. They want an economy that works for them and a political system that responds to their needs. It’s more than likely they will be disappointed. Even if by some miracle Trump or Sanders is elected, change will be slow and incremental if there is change at all. But the winds of change are blowing away from establishment politicians and the wealthy donors who support them, and as far as I’m concerned any change that helps the working class feel more secure and confident about the future – change that is based upon reality rather than the myths that have been sold to the public in support of wealthy interests – can’t come fast enough.